I recently had the opportunity to get my hands on the Feelif – and this is a device that you really have to touch to fully appreciate. I had seen photos of the Feelif, but no photos really do it justice. I was impressed with how Feelif is able to combine native features of the Samsung tablet, like vibrations and the built-in screenreader, with a tactile surface to create a whole new learning experience. Read on to learn more about how Feelif works! Feelif comes in three sizes. The Feelif Creator and Feelif Pro are Samsung tablets retrofitted with a clear tactile surface attached to the screen. This tactile surface is comprised of raised dots that you can feel when scanning the screen with your fingertips. At the top of the screen, the dots are set as braille cells, 6 dots to a cell. The smaller Feelif Gamer is based on a Samsung smartphone and instead of raised dots, the tactile grid is made of raised lines. All three devices can connect to the internet through WiFi or can be enabled with a cellular plan. The Feelif Gamer can also be used as a phone! Each Feelif device comes preloaded with the Feelif application which relies on the tactile grid as well as Samsung’s native vibration features to guide your fingers across the screen. These tactile guides, accompanied by clear audio descriptions and instructions through the TalkBack screenreader, create a fully accessible learning environment or fun multi-sensory game play that both sighted and blind kids can experience together! Now I don’t want you to get the wrong impression about those dots on the screen. My first thought was that they would move up and down creating tactile images and braille in three dimensions. While that’s definitely something Feelif would love to be able to do in the future, that’s not quite where the technology is just yet. But the tactile grid does serve as a guide. The dots may be static, but you can move your fingers along a line of dots while listening to the voice output for directions looking for shapes or lines that will vibrate or make different sounds when you touch them. The combination of all four (tactile dots or lines, vibrations, sounds and voice output) transform the usual flat surface of the tablet or smartphone into something very unique and completely accessible. Short answer? A whole lot! Feelif comes in multiple sizes. I’ve had the chance to play with the Feelif Gamer and the Feelif Creator. The Gamer is based on a Samsung phone with a 5.2″ screen while the Creator is made with a Samsung tablet with a 9.6″ screen. After playing with both I would definitely recommend the Feelif Creator for the wider space, but the Gamer is nicely compact. There is also a Feelif Pro which is similar to the Creator but with a larger 9.7″ screen. 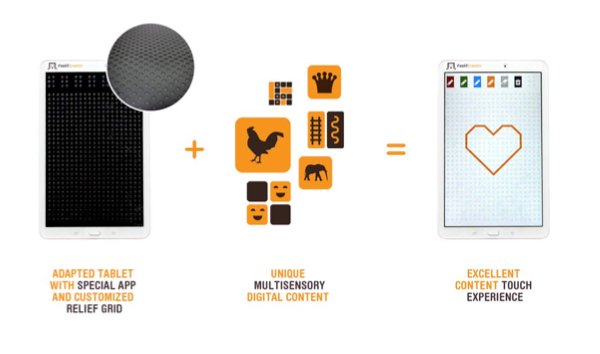 The Feelif Pro comes pre-loaded with two educational apps (Draw and Geometric Functions) and two game apps of your choice while the Feelif Creator comes pre-loaded with one educational and one game app of your choice and the Feelif Gamer comes preloaded with two game apps of your choice (the smaller Gamer can only play games while the larger Pro and Creator models allow for both educational and game apps). One thing that makes the Feelif so unique is that there are so many apps to choose from! There are almost a dozen apps in total that you can add to your Feelif (each sold separately) to create your own personal experience. By choosing your own Feelif apps, you can focus on learning the braille alphabet and exploring geometric functions in the coordinate system or you could tailor your Feelif to focus more on identifying basic shapes and animal sounds. It’s really up to you how advanced or simple you want your Feelif to be! How can you get a Feelif? Feelif devices, educational and play apps are all available on the Feelif website! The devices are a little pricey, but keep in mind that you are also purchasing a smartphone or tablet which can be used as any smartphone or tablet (although the phone does not come equipped with a SIM card). You are not only investing in a fully supported accessible device, but you will also have access to the internet, email and other apps available on smartphones and tablets.